Press Release: November 16, 2013 By LunchBox Communications- While Kickstarter has given the film more national and International press than we imagined, including this week's feature coverage on WHYY Newsworks, we are far away from our $35,000 campaign goal for any comfort since Kickstarter is an all or nothing crowd funding platform. It takes a village... or in this case, sports fans, boxing enthusiasts, after school program supporters, production crew and anyone standing next to you with a credit card... to complete this documentary that not only presents a compelling biopic of the first Super Heavyweight Champion of the world but highlights the struggling community in West Philadelphia that is giving the champion-- and the sport of boxing--a hopeful comeback. This is such an important project -- not just for those of us who have dedicated ourselves to it, but for the many that can be helped and inspired by this incredible story. Don't wait! Be a champion for this project and back our Kickstarter campaign. Share the links with your social networks, your good friends and colleagues. Material Courtesy of: LunchBox Communications Used with permission. Can Pacquiao Rebound Against Rios? 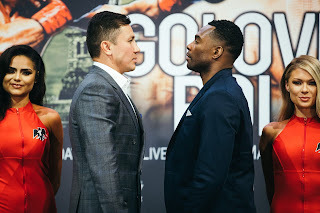 What's Next For Gennady Golovkin?